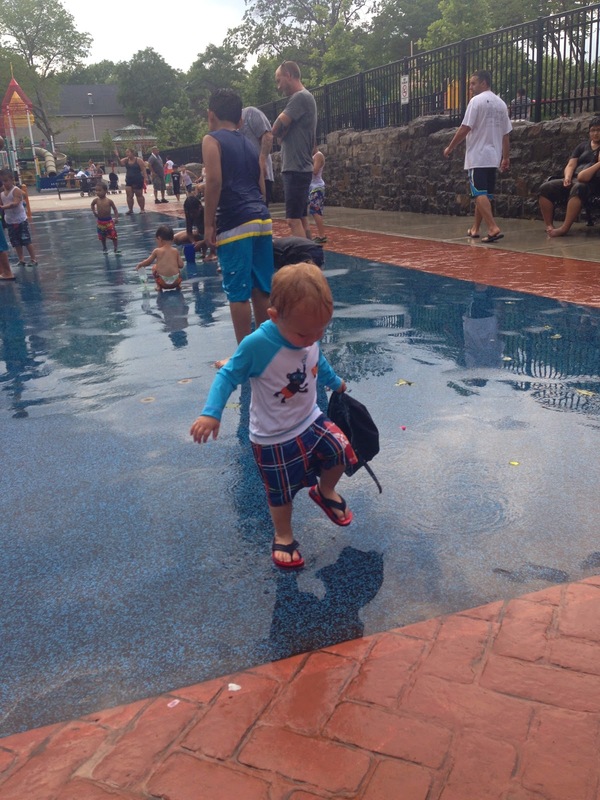 Last week I started a list of some of our favorite kid-friendly activities this summer. My last post required a beach, which I realize most of us do not have access to. So today, I made sure to include some other water fun we have had that you could duplicate almost anywhere you live. There is a huge park just a few blocks from where we live that has a splash pad in the summers. We often go to the playground over there but lately it has been too hot (there is, unfortunately, not much shade over the play structures) and it's also so big that my ever expanding pregnant body has a hard time keeping track of my speedy little tike as he races from one play structure to the next. One miserably hot day we skipped the playground and met up with a friend and her daughter to check out the splash pad. It took some convincing but eventually Eli and Evelyn decided the water wasn't so scary and braved the outer perimeter where they could splash in the puddles while still avoiding getting hit by the fountains of water. Eli loved trying to fill his bucket which, given that the distance the fountain sprayed varied from closer in to further out, was rather entertaining as his little brain tried to process this and react in time to get the water before it moved again. I was glad we brought buckets and a beach ball since these two munchkins weren't into running through the fountains. Although next time we will bring two beach balls as they had some difficulties sharing. And by they I mean Eli. Our day at the splash pad was a huge hit with these two and best of all, it was free. If you don't have a splash pad in your area but you have a yard, grab a sprinkler or two and make your own "splash pad" at home. It's still free and, even better, it won't be crowded! This is an obvious one but I couldn't not include the pool in my list. We have a local pool nearby but it costs money and it's usually really crowded and it's not the cleanest of public pools. For all those reasons, I have no desire to ever go again. Fortunately, we live near a lot of apartment complexes and we know people who live there. This means we have access to a pool that isn't overly crowded and costs us nothing more than the price of a coffee to say thank you. We have two different pool options through two different people and both are great for different reasons. Sorry for the overuse of "different". One is shaded most of the day, which is nice for little ones and pregnant mamas, and the other has a kiddie pool that is only a foot deep so they can play and splash on their own. If you don't want to mess with the crowds and prices of a public pool, make friends with someone who has a pool or has access to a pool for an easy afternoon of (free) fun. The best part about the pool is it burns LOTS of energy which pretty much guarantees a long nap which means lots of time for moms to get things done. Or, maybe even to take a nap of their own!!! If you don't have access to a pool or a splash pad, you can still have plenty of water fun at home. Obviously you can get your own blow up or plastic pool for your yard if you have the space and a water faucet outdoors. I looked into this option but unfortunately, our yard doesn't have a water faucet outside (??? I thought that was standard in all houses but perhaps not). Not wanting to haul buckets of water back and forth to fill a pool, I decided to fill a few buckets and some watering cans one afternoon and let Eli do his thing. I grabbed an empty yogurt container and he used that as a scoop to fling water all over the yard. He had the best time flinging water and "watering" the grass and some of the concrete with his little watering can. We also worked on pouring water from one bucket to the next which was a good concept for him and also good for me because then I didn't have to keep refilling empty buckets! If you have a yard or a even a small patio this is a great option for you. It's super cheap, most likely you have a bucket or some kind of large container to hold water, and doesn't require much space yet still provides a good hour or more of entertainment with minimal cleanup. Never underestimate the power of a nice cool bath! If your kid loves the bath, don't hesitate to fill it up and just let them play. Throw in some bubbles and make funny hair do's or "beards". Grab some bath crayons (you could even make your own) or some bath paint (DIY options) and let them become little artists. The fun they have, and the break you get, is worth the extra scrubbing, I promise. If you're not familiar with the Highline, it is an old, elevated railroad that has been turned into an urban park on the lower side of Manhattan. I love the Highline, and always recommend it to people when they visit the city but in the summer it can be unbelievably warm up there. Last week we had visitors, so of course we took them for a walk along the Highline. We stopped for a New Orleans at Blue Bottle Coffee, one of my favorite summer coffee drinks, but Eli was getting fussy while we waited so Luis took him to sit down on one of the benches nearby where there also happened to be a sort of, well, I don't know what you call it but there was water that you could put your feet in and that cheered our boy right up. I realize this activity is specific for those of you who live in NYC or the surrounding areas, but I couldn't not include it because we had the best time splashing around, and it certainly helped keep us cool. Eli could have stayed here forever. If you're going crazy one afternoon and have run out of things to do (and if you live in the vicinity of the city, sorry), head on over with your little one and burn an hour or so getting your feet wet on the Highline. One more day of summer fun coming soon. Happy Monday!